8 key training institutions on information security under Project 99 signed a Memorandum of Understanding on cooperation in training and scientific research on information security on March 29. Deputy Minister of Information and Communications delivers speech at the conference. The signing ceremony took place within the framework of the Conference on the Safety and Information Security Training Institutions under Project 99, organized by the Institute of Cryptography and the Information Security Department of the Ministry of Information and Communications jointly organized. 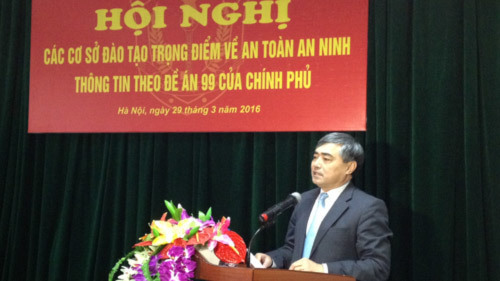 Speaking at the conference, Deputy Minister of Information and Communications Nguyen Minh Hong, Chief Executive of Project 99 emphasized, recognizing the importance of building human resources of information security so early in 2014, the Prime Minister Promulgating Decision 99 approving the Scheme on "Training and developing human resources for information security and information security up to 2020". One of the six tasks of Project 99 is to support key institutions, update knowledge and skills for trainers, develop advanced training programs for lecturers, upgrade laboratories for digging create and research to enhance the capacity and quality of information security training. However, in order to do this well, key training institutions must constantly reform, innovate training methods and programs, meet social needs, improve the quality of training, cooperate with the prestigious universities in the world. Schools also need to work closely with the business to provide students with access to real-world, soft-skills training while they are in school. In particular, the training institutions should also pay attention to the training of professional ethics for this human resource. 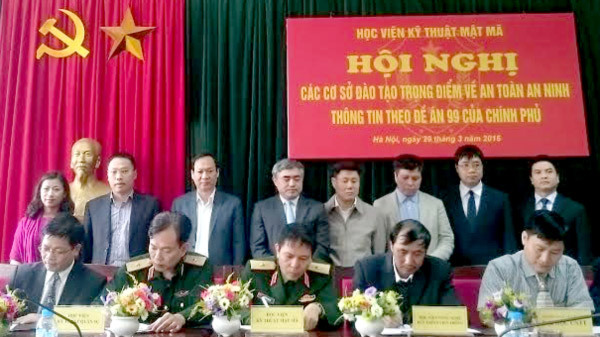 Deputy Minister Nguyen Minh Hong witnessed the signing ceremony between 8 training institutions. At the same time, universities will exchange scientists, scholar researchers and specialists for the purposes of training and scientific research on information security; Coordinating organize the forum, playing on the field of information security for students of schools. 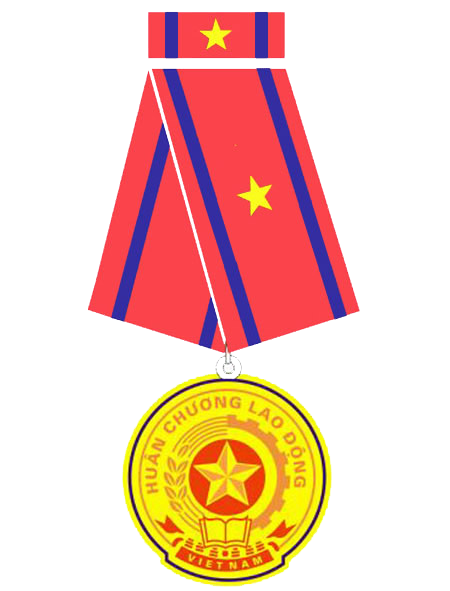 The implementation of the cooperation agreement is also agreed by the eight establishments, which rotate each unit responsible for each year activities. At the beginning of the year (or at the appropriate time), the unit chairing the annual work plan; Plan meetings for units to agree on the content of specific work plans will be held in the year..